We offer fun team-building activities for teachers and staff. It’s a great opportunity to collaborate and create together. We bring to you Paint Parties filled with music, painting, and singing. Our paint sessions vary from fun-filled paint parties to calm therapeutic paint classes. 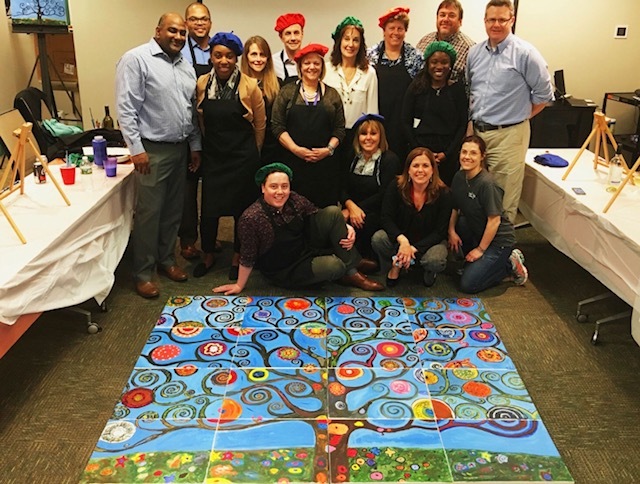 We do team building murals, where the participants create one piece of a larger canvas, as well as individual canvas paintings. Staring at $25 per person for a 2-hour paint class. We offer 2.5 and 3-hour events as well. Additional party time can be purchased.